Are we still in Wheaton? We are. Haven’t had the blogging energy lately, will see if I can get it back and write up some of the backlogged restaurant visits I’ve logged recently, mostly outside of Wheaton. In Wheaton, I had a craving for Chinese and decided to revisit Wong Gee (2417 University), where we ate a couple of times when they first opened maybe eight or nine years ago but hadn’t since. Back then, we thought it was okay but nothing special. The dining room wasn’t crowded — unlike the packed Mi La Cay next door — but the dozen or so eaters were all Chinese, and that can’t be a bad sign. I’m sure it depends what you order, like in most restaurants, but Wong Gee is officially back on my radar thanks to a couple of dishes. In particular, the crispy beef Szechuan style is the closest thing I’ve found locally to the fabled Beef with Orange Peel at Menlo Park’s Hunan Garden. CBSS is not as orange-y, but otherwise has a similar flavor profile and crisp-chewy texture. I asked for it spicy – SPICY!! I shouted at least twice into the phone when placing the carryout order — but it didn’t turn out spicy at all. They need to put the SZECH back in their Szechuan, or maybe I just need to learn some Chinese in order to convince them I can handle the heat. Even so, it was very good, and if it is any zippier next time it will be a great dish. The kung pao chicken had more of a kick, plus good flavor and plenty of chicken and peanuts, not as good as the Joe’s Noodle House version but well above average. Primary Wong Gee kung pao drawback is the over-reliance on celery as filler — Joe’s is all chicken, peanuts, and peppers, as it should be. At least Wong Gee doesn’t use water chestnuts *shudder*. I also liked the Singapore style rice noodles, which again could have been spicier but were tasty anyway, with plenty of curry, similar overall to Fried Good Dale but with super thin noodles and less pork, and less grease. Roasted duck and noodles in soup is pretty good, although the duck has a lot of bone and fat and is just too much work, in soup. In general, soup looks like a good way to go at Wong Gee, and there are plenty of options on the menu. After floating down the Alaskan coast we disembarked for the last time, in Vancouver BC (Canada!). We love Vancouver and always wish we could spend more time there, but with less than 24 hours this time and crazy early flight the next morning, we stayed in an airport hotel and stuck to Richmond, Vancouver’s southern suburb. Food-wise, Richmond is notable for its density of Asian restaurants, “the best Chinese restaurants outside China” according to one possibly hyperbolic local guidebook. That point is arguable, and moot; they don’t need to be “best” they just need to be good, and they are. One local food blogger, 365 Days of Dining, spent a year visiting and reviewing one Richmond restaurant (mostly Asian spots) per day for an entire year, and local food bloggers always know everything, OMG they are so awesome, so of course we tried a couple of her recommendations. Richmond’s main Asian (about equal parts Chinese, Japanese, Korean, and Vietnamese) drag is Alexandra Road, and our hotel was conveniently on that strip too. For lunch we hit Seto Japanese Restaurant (#155-8460 Alexandra Road), which looks like nothing from the outside or even in the lobby, but then you walk through a little arch into the dining room and it’s like passing into a Tokyo izakaya or something. Each booth has high paper walls, so it feels secluded even with high decibel levels overall. Instead of the usual teapot, big individual mugs of piping hot green tea materialize right away. On 365 Day’s recommendation we tried the spicy tuna rolls, boasting a better than average filling to rice ratio and whose interior is a smooth pate of tuna and who knows what else: delicious. We devoured perfect gyoza, light dough melting away in our mouths to reveal savory pork filling. Shoyu ramen was excellent, similar in size, quantity, and ingredients to Ren’s Ramen in Wheaton, but only $8, a steaming bargain. I think Ren’s broth is even more savory and flavorful, but Seto’s is great too. We also got some sushi, all good. Wonderful lunch spot, and we were lucky to get in without a reservation even after the main lunch rush. For dinner we hit the Cattle Cafe (8580 Alexandra Road), right next door to our hotel. Aka Cattle Hot Pot, this is a local fast-casual chain specializing in soups — so naturally I got a curry instead. The curry was nose-runningly spicy, just how I like it, but otherwise kind of boring, just a yellow curry sauce over some beef, potatoes, and rice. Mrs. Me and others ordered soups, which you can customize or just pick one of nearly 100 (at least it seemed that way – big menu for a little restaurant) prepackaged options. The soups were as good as advertised, big bowls, flavorful broths, fresh noodles; the Malay Laksa soup was even spicier than my curry plate, evident just from the slick oily red-orange patina floating on the surface. If I ever go back, I’m totally getting the Malay soup, although they also have a Szechuan soup option that I bet offers equal pizzazz. Everyone else in the mostly-full dining room looked Asian, and many were ordering more adventurously than we were; there was a lot of baked-seafood-in-cheese going on, which isn’t really my thing but seemed quite popular. The place is authentic, in a very modern way (sleek orange-brown-steel decor reminded me of Panas). And also a lot of soup ordering, which was clearly the way to go. 365 Days’ review of Cattle Cafe is here. Happy Chinese New Year. 2012 is the year of the Dragon — an appropriate year for Smaug to appear. We could use some dragons around here to liven things up on such a drizzly, misty, slushy, gloomy day. So far it feels more like the year of the Eeyore. I suppose one could cheer oneself with some delicious Wheatonian Chinese food. WaPo recommends Hollywood East (as they often do) as part of their Chinese New Year cuisine photo essay, and I agree those steamed dumpling swans are adorable. Lots of options though: New Kam Fong, Wong Gee, Full Key, Paul Kee, Good Fortune, plus the more fast-foody Brother, Kenny’s, Ming Tree (in the mall), Jenny Express, the place over on Ennalls I can never remember its name…none serving dragon, but each has its fans. Boy do we have a lot of Chinese restaurants in Wheaton, per capita. Couldn’t one of them transmogrify into an Indian curry joint? Also, completely unrelated: Just Up The Pike published two informative articles on Wheaton redev last week, the first one followed by the results of an interview with developer Leonard Greenberg, who owns pretty much all of downtown Wheaton (actually about a third — that’s a lot!). Nothing like Chinese restaurants on December 25. The Chevy Chase outpost of Meiwah (4457 Willard) was hopping on Christmas night, though you would never have known from the barren emptiness of the street below — I’m pretty sure I saw a couple of frosty tumbleweeds blow by. But inside, Meiwah’s lobby was nearly impassable from all the people waiting, hoping, praying for tables but who did not have reservations. And the enormous dining room was also packed with happy eaters and efficient servers, a couple of whom had donned Santa hats for the occasion. We had a reservation. I’m sure the lady who, as we arrived, hissed “we’ve been waiting more than a half hour!” at the hostess was not happy to see us immediately seated while she continued to wait. Let that be a Christmas lesson unto her, and us all: make reservations. Atmosphere was festive, convivial, and the food was pretty good too, especially the starter of razor-thin seared tuna sashimi in a spicy citrusy sauce. Delicious. Meiwah also does great greens, we all loved the sauteed spinach with garlic and…was it sweet mirin in the sauce, or sesame oil, or lemon, or something else? Whatever it was really worked. 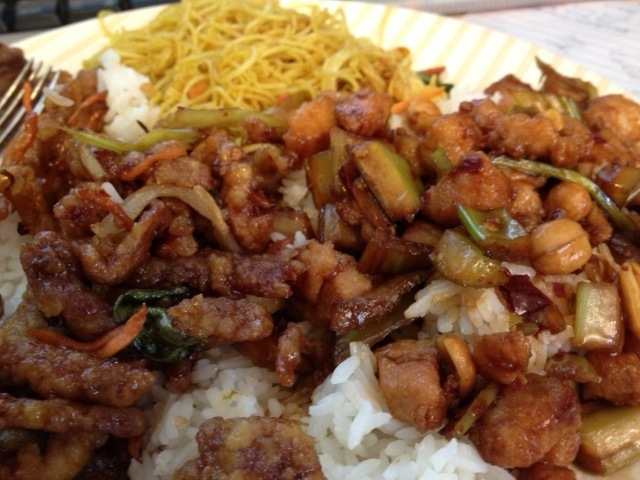 They also offer an “Atkins-friendly” selection of entrees that are sauteed instead of deep-fried as usual, and the General Tso’s chicken was good like that, tender and saucy. Crispy shredded beef was indeed crispy and shredded, but not at all spicy despite its chili pepper menu icon, so I was a little disappointed even though it was otherwise a successful dish. Last weekend’s Washington Post article on the developing chicken “paw” trade war between the U.S. and China caught my attention. I have never eaten chicken feet but am getting intrigued; I know many Chinese restaurants sell them (for sure Hollywood East and probably others in Wheaton too), and I believe H Mart* and other local Asian food purveyors carry them in case one wants to cook ’em up at home. Which apparently is fairly easy to do. It is nice to know that U.S. chicken feet are most coveted in China due to their relative meatiness. 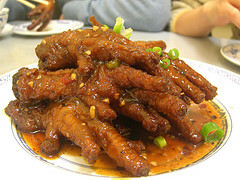 I eagerly await the stateside marketing campaign in 2012… More on the freakonomics of chicken feet here. * Odd and amusing: if you search the H Mart website for “feet” you get a list of mostly hair curlers. A search for “chicken” gets a list of mostly not-chicken-related items, led by Aveeno Baby Soothing Bath Treatment. Finally got around to eating at Full Key (2227 University, in the strip mall with Max’s), historically regarded as one of Wheaton’s better Chinese restaurants. By whom? You know…some people. I wouldn’t rank it that high. Unlike my favorite Rockville Sichuan hotspots, all the Chinese restaurants around here are Cantonese/Hong Kong style, both the old school haunts like Full Key, Paul Kee, Hollywood East, and Good Fortune, and the new kids on the block like New Kam Fong and Wong Gee. Of course there’s also Jenny’s and Kenny’s and Brothers (pretty sure no apostrophe in Brothers — outlier! — which makes sense because there would have to be more than one, wouldn’t there? ), which aren’t really anything in particular, just Americanized Chinese (and not too bad, if that’s your thing). And Full Key just isn’t as good as most of those. Full Key has a sticker above the door, something like “We get great reviews on Yelp!” If you read Yelp reviews (which I mostly don’t but forced myself to this time) you will find widely mixed reviews of Full Key; the allegedly terse service tends to get ripped, but a few dishes are lauded again and again: clams with chili and black bean sauce, stirfried snow pea leaves, and roast duck/pork. But for us the service was fine but the food only okay. Service was not particularly enthusiastic or outgoing but was perfectly friendly — we even had to send a dish back when they beefed our noodles instead of porking them, and they apologized and took care of it no questions asked. We didn’t order the clams because Mrs. Me doesn’t do clams; we didn’t order the snow pea leaves because they aren’t on the current menu, which while not “short” is still probably the shortest Chinese restaurant menu I’ve seen locally. That could in theory be a good sign — quality not quantity! — but it wasn’t really in practice. We did order roast duck, and it was good, but not better than at New Kam Fong or Paul Kee. It was greasy, as some Yelpers had noted complainingly: of course it was greasy, it was roast duck! And it isn’t really grease, it is sweet duck fat from heaven. Our favorite dish was the wonton soup, which had very rich yet clear broth with double-digit tasty shrimp dumplings afloat. Szechuan string beans were good, Mrs. Me cleaned that plate, but could have been spicier; shredded pork Szechuan style was gloopy and bland and weighted too heavily to green peppers, everything bad about Americanized Chinese food in a single plate. Actually it could have been worse, it could have included water chestnuts. But that’s what I get for ordering Sichuan dishes in Cantonese restaurants, a lesson I repeatedly fail to internalize. All in all an okay meal with solid, quick service in the surprisingly small and tired-looking Full Key dining room. Wheaton’s Chinese food scene is pretty competitive these days, with a bunch of good options, and while Full Key may once have been top tier, it is no longer. 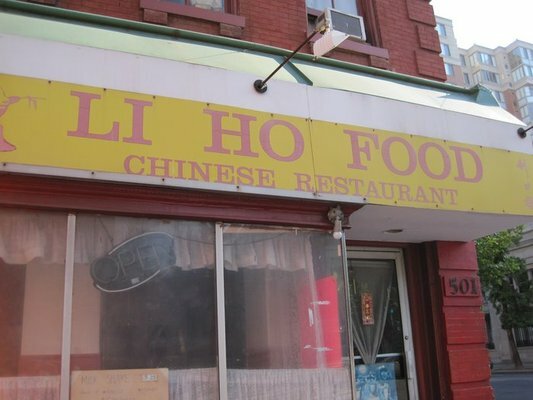 DC Chinatown’s Li Ho Food (501 H Street NW) is the kind of dive that makes other dives seem opulent by comparison. Mostly a takeout joint, it has seating for a dozen or so people but the tables and chairs are bare bones, nothing on the walls, mostly exposed kitchen is a grease fire waiting to happen, even the fairly large windows are barely translucent after years of buildup of questionable substance. The food turns out to be a fine value. I hadn’t been since maybe 2007, and if anything the orange beef has improved over the years: the chunks used to be too small but are now right-sized, good breading-to-beef ratio, and the sauce is a nice spicy-sweet balance (could lean a bit more to the spicy side but that’s nit-picking). Certainly best orange beef I’ve had in greater DC (a low bar, alas). Pork lo mein, so often an afterthought, is also above average, with surprisingly rich meaty chunks of pork; the noodles are pretty greasy, but that’s not a big negative in my book. Portions are huge, prices are reasonable, and if you eat in, you might enjoy as we did listening to the owners have animated discussions in Mandarin (or something) as they sit at the table behind you. I also love how the male half of the ownership team serves dishes with an exaggerated flourish, as well as a smile. The quality service, though a bit slow, is a match for the quality divey atmosphere. Large portions also sometimes extend to the fortune cookies. Mine contained three fortunes, two of which were identical: “You will have no problems in your home.” I’m hoping that makes it doubly true, and doesn’t somehow cancel itself out. I also got: “From now on your kindness will lead you to success.” My friend Carl is an experienced cataloger of cookie fortunes; I wonder what he will think of this trifecta?